This past Sunday our Sunday Photo post focused on “Flour Power.” Well, flour has definitely taken on power, and new meaning for me in the past five years. On my journey to rid our kitchen of processed and pre-packaged food, I have also taken some detours and now local food plays a very important part of this journey as well. Flour, also gives me freedom. 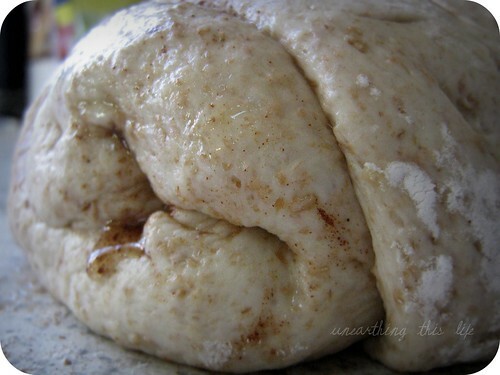 The freedom and power to make things like bread and pizza dough. Crackers and muffins. Sour dough starter and white sauce. I know where my flour came from and I know what the ingredients are in the things I make. 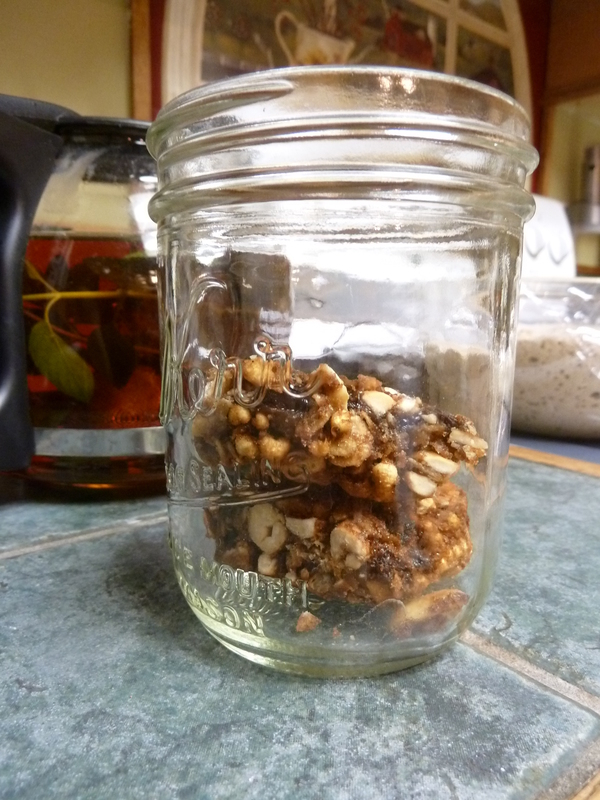 Not only do I know the ingredients, but making these things is also frugal. I know it costs a lot less then buying a loaf of bread at the market. In Sunday’s post Alexandra talked about finding local flour in Wisconsin a few hours from where she lives. I finally found a source for wheat in Texas that is about 500 miles away. YIKES. Texas is fifth in the nation in wheat production, and it is hard to find wheat or flour locally. Hmmm. Fran talked about flour and its connection to communities. On any given day, I usually eat something that I eat that has flour in it. Toast made from homemade bread to go with my morning eggs. Maybe a granola bar in the car on the go. 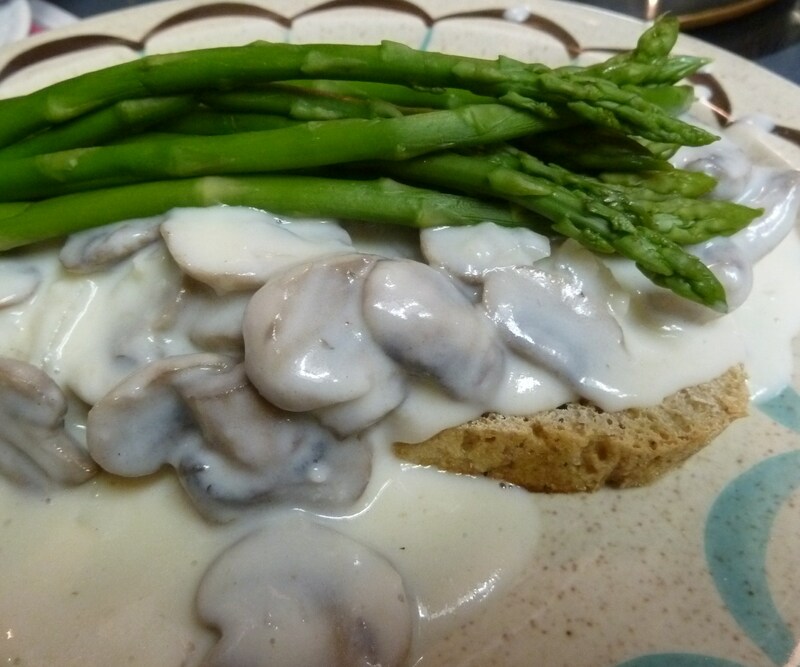 Last week for dinner I made a mushrooms in a white sauce using flour, served if over toast and topped that off with steamed asparagus. Flour is one of the staples that I would never want to be without in my cupboards because it plays an important part in our meals. I am grateful that I have the time to make these things at home. What part does flour play in our kitchen and life? Here at Chiot’s Run baking bread is a weekly occurrence. The oven is on all the time, especially in winter, producing loaves of all shapes, sized, colors and flavors, many are tucked away in the freezer for summer eating to save time during that busy gardening season. 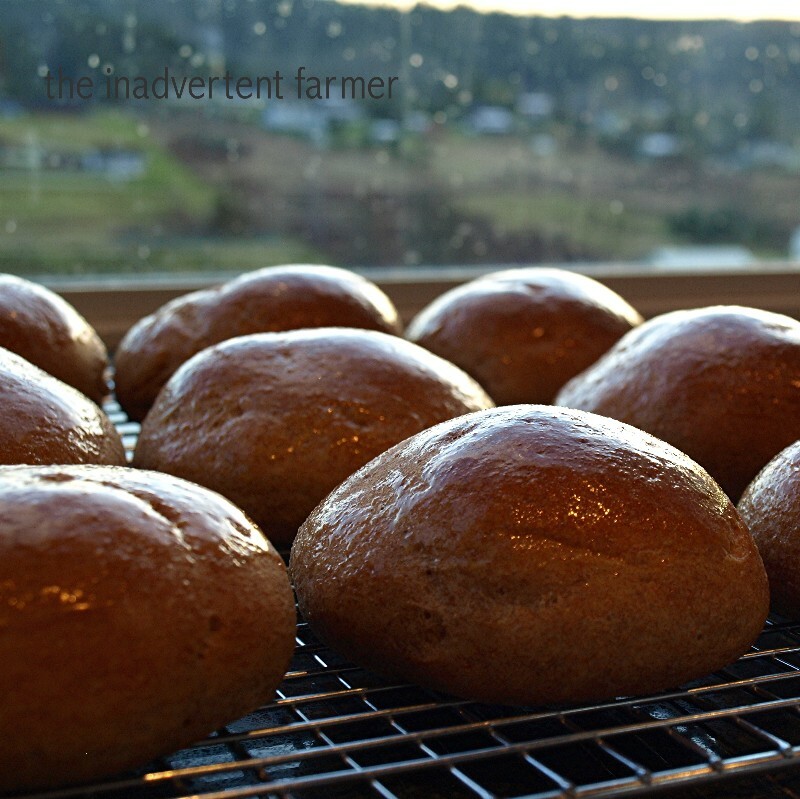 In the summer the oven is on less often, usually on once or twice a month, producing enough bread to last for 2-3 weeks and a batch or two of scones, biscuits or zucchini bread for quick breakfasts and of course some hamburger buns for those summer cookouts. It doesn’t get much better than the smell of freshly baking bread, scones, or biscuits in your own oven. We haven’t bought store bought bread or baked goods in many, many years. Here at Unearthing This Life, cooking runs in our blood. Both Hubby and I spent time working in restaraunts on the prep side, grill side, and saute areas of the kitchen. We both took our respective turns behind the bar and out on the floor as well. Neither of us spent much time baking (even though I enjoyed a short stint in a bagel bakery). It took going through the Real Food Challenge for me to finally understand baking from scratch. So, it may be surprising for some of you to know that bread is relatively new to me. Now that I finally “get” bread making, I have to prepare it about twice a week. Since there’s three of us, and we’re homeschooling, we go through our loaves rather quickly. 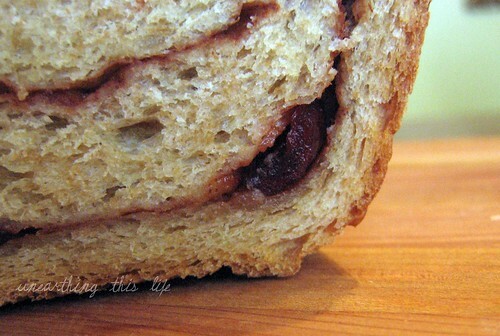 And one loaf of bread is always cinnamon cranberry swirl, with extra honey. That is our breakfast bread. 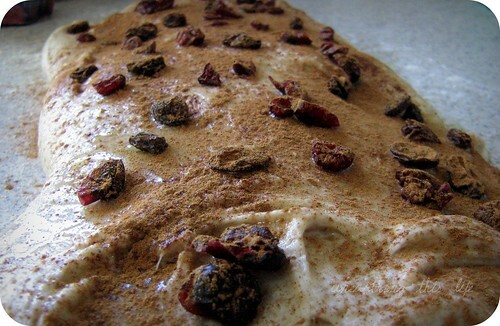 It makes fine french toast and an excellent dessert bread as well. Other than bread, a regular treat for us is pizza. Every Friday night is pizza night. Even if delivery did travel this far out in the Boonies, I don’t think I’d opt for that choice considering the taste of the pizza we prepare. I did grow up 25 miles outside of Chicago after all – and I know what pizza is supposed to taste like. Since Hubby was ordered on a low triglyceride diet almost three years ago, we severely limit our other sources of simple carbs. Carbs in our house serve a purpose – to introduce healthy grains, extra fiber, and fermented foods into our food source. Our dough always includes whole wheat flour, with whole grains added, and fermented with sourdough starter. Having too many family members with gut problems forces my recipes to consider their needs first and foremost. 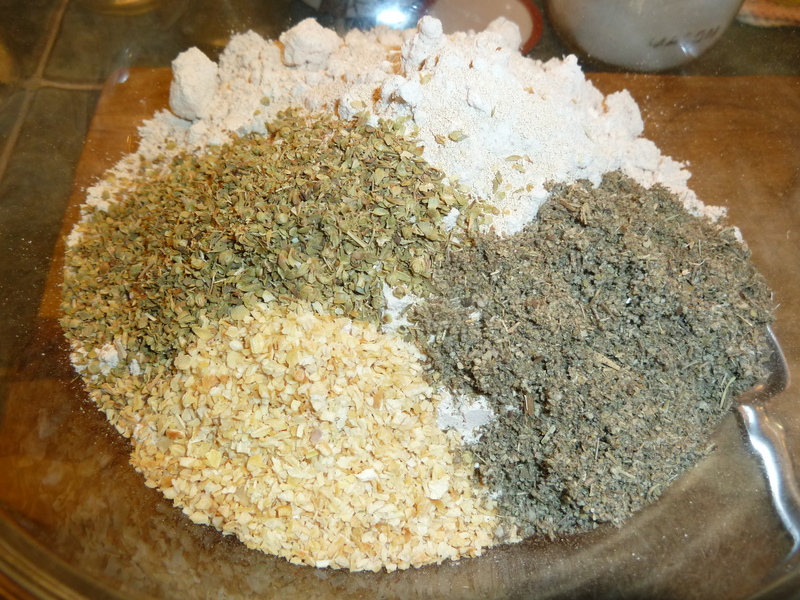 Using sourdough and organic flours seems to help reduce tummy issues. Hubby also weighs in on average 25 pounds less than normal now that we’re concious of the types of carbohydrates he consumes. I think that goes to show that you can eat your carbs and have your health too, as long as you limit yourself and make sure you’re consuming quality grains. 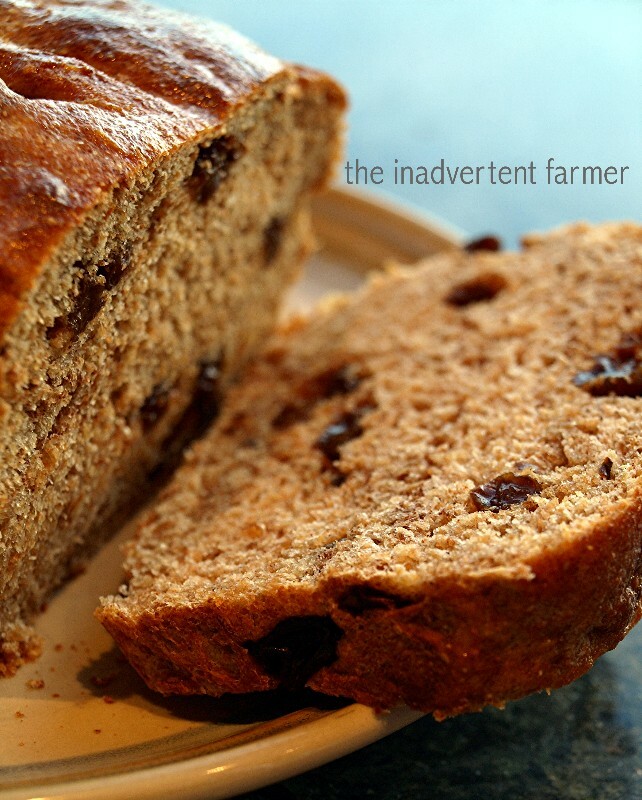 What do you bake that fills your spirit or mends your body? Real Food Give-away Week Three Winner! With all the cooking that has been going on around here there is one thing that is a constant in my kitchen. 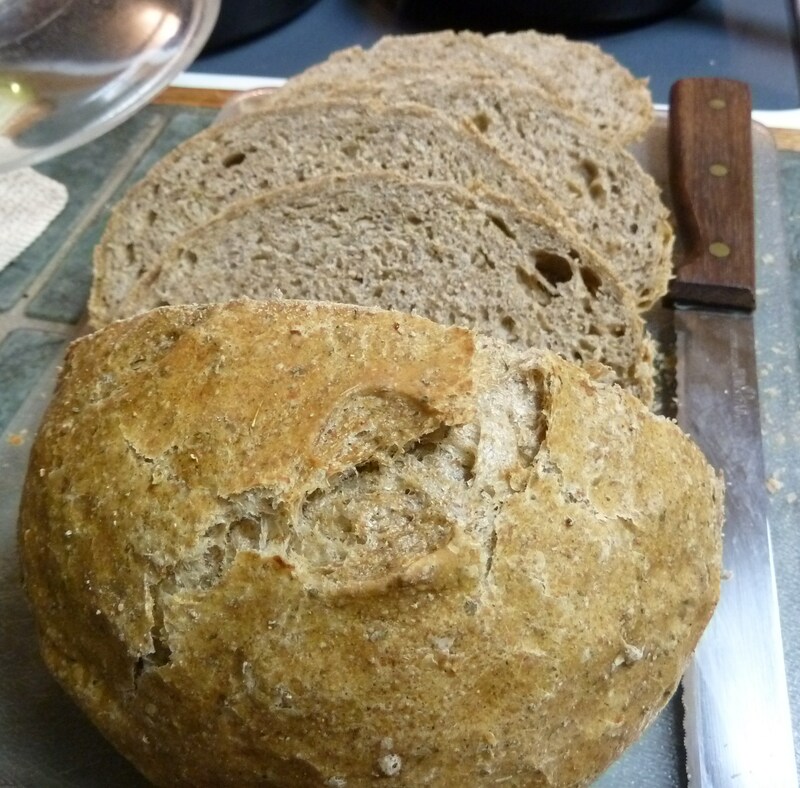 No matter what else I’m cooking, I bake bread twice a week, rain, shine, or otherwise. And although I experiment with different types of artisan breads my sandwich bread recipe has remained fairly constant for decades now. It makes 6 loaves or in my case 3 loaves and two pans of raisin sticky buns! Add this to the yeast mixture and mix. Mix thoroughly then knead for 10 minutes. 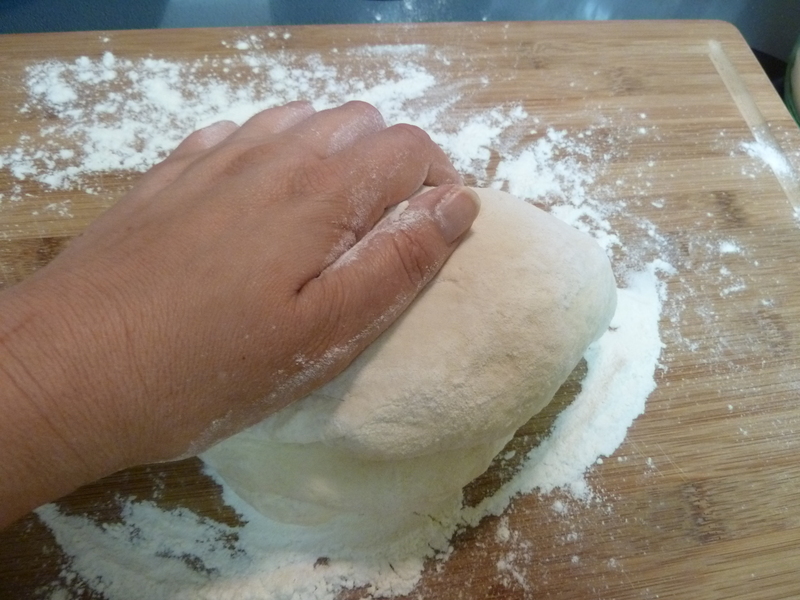 When it is kneaded put it in a large bowl (or in my case a large pot with lid) cover and let rise until doubled. 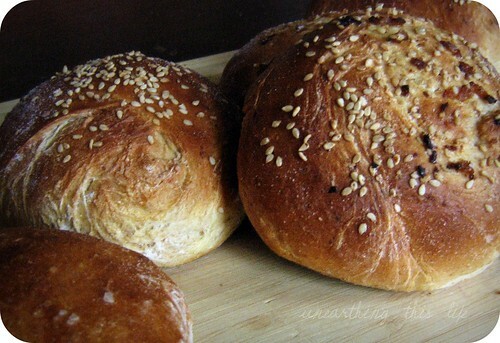 Punch down and make into loaves, sticky buns, rolls or whatever you are craving at the time. 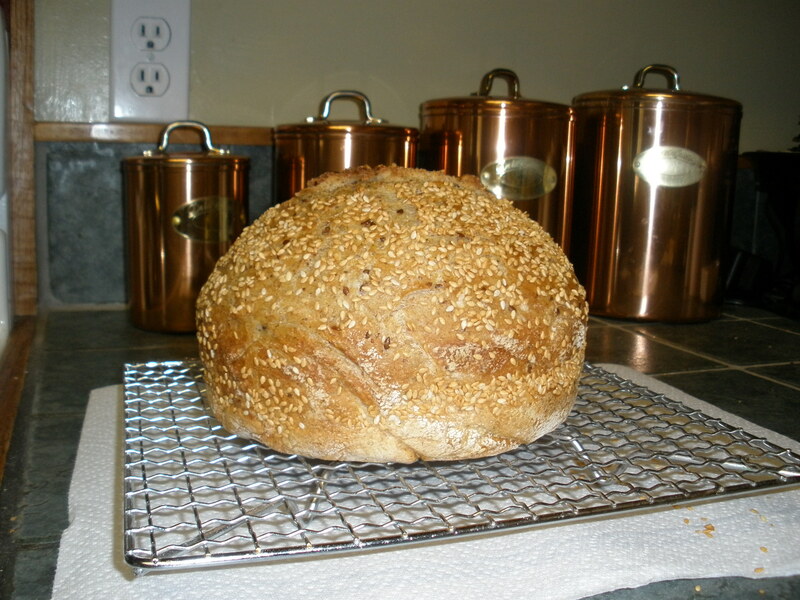 Let rise again until the bread is 1 1/2 to 2 inches above the rim of the loaf pan. Bake in oven preheated to 350 degrees. 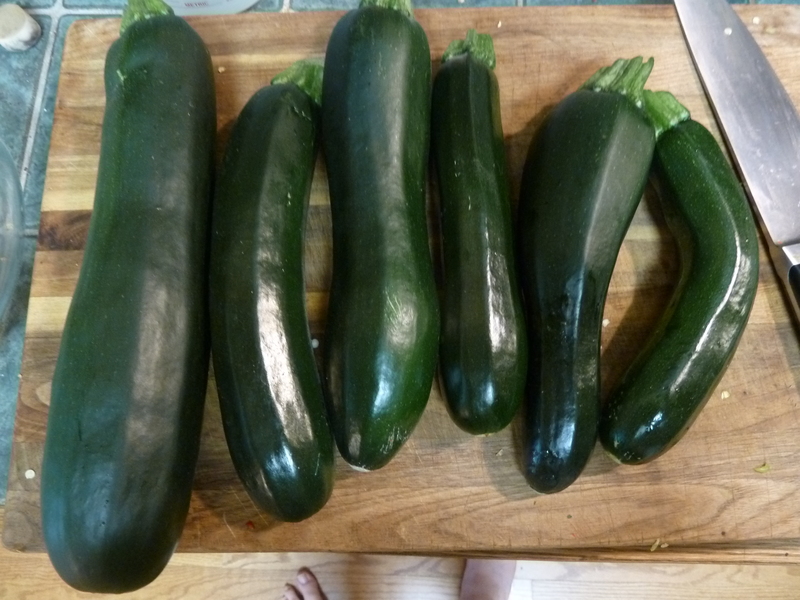 Here is where I’m a bit of a dork…I’m not sure how long to bake it. I have never set a timer (although I will try to next time so I can report back) but I’m guessing about 25 minutes. I can tell by the color and the sound when I thump it if it is done (it will sound hollow)…sorry for not being more precise. Remove from oven, cool on wire rack. 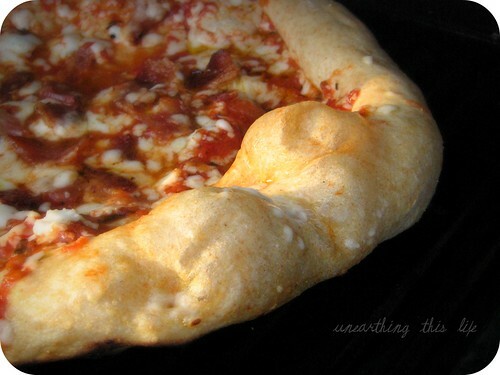 I always put butter on the top crust when it is hot. 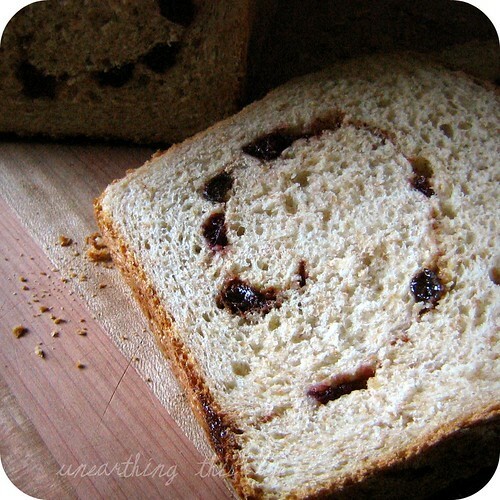 If you want a step by step in-depth tutorial with pictures… go to bread baking part 1 and part 2 on my blog.